There’s nothing more tedious than having to return to one’s home in one fell swoop after days spent in a glorious part of the world. Crossing a bridge on our return we noticed some paddlers and swimmers in the river below and so decided to join in the fun. Unlike our own bracing Lima the waters were warmish, probably because they had been fed by nearby volcanic springs (which we were told had been assaulted by hordes of holidaymakers). Here, instead, all was peaceful and quiet and we enjoyed time with natural hydrotherapy and tiny fish biting our dead skin off us while the glorious Maremman countryside encircled us. That was not the only water we dipped into on our return to the Val di Lima. The bay of Baratti (I prefer to call it a cove) is a beautiful corner of the Tuscan coastline and so unspoilt. It also has the added bonus of an important Etruscan necropolis behind it. We didn’t make it to the acropolis but were able to admire a tumulus that somehow reminded me of New Grange in Ireland. Indeed, I was confirmed in my supposition by the excellent guide who’d visited it. Among the other tombs there was a perfectly preserved temple tomb, only discovered quite recently. The beach was very near and after negotiating a strand of seaweed we found with water warm and clean and surrounded by some lovely umbrella pines. We took a flight to a tropical island a couple of days ago. Using the latest technology our rocket took just thirty minutes to get there. We then went through a rain forest to find a magic pool with lovely fresh cool mountain water flowing into it and surrounded by stones carved by an ancient race of giants and used as their pillows and chairs. 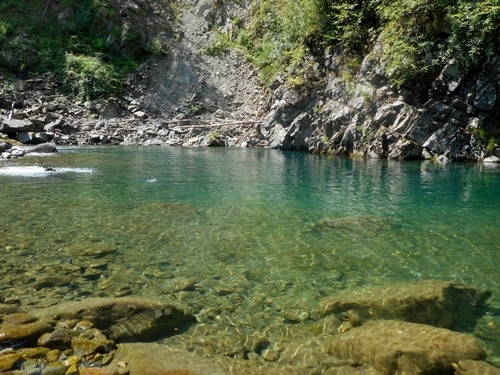 There was no-one else there apart from some sylvan river goddesses who appeared from below the blue pool. They advised us to keep the place secret otherwise we would be torn apart by savage hounds that would protect the nymphs against unaccepted humanoids who violated the sacred purity of their arcane playground. Now believe this or not as you like. But we all have our dreams and that morning our dream became a reality, albeit a surreptitious one…. PS we were home for lunch and the hounds didn’t touch us! There’s a delightful railway route from Florence over the Apennnines which takes in some very sweet small towns and also some major cities. We discovered this route some years ago when the first part, which goes from Florence to Borgo San Lorenzo, had still not been reconstructed after being damaged by the Germans in World War Two. It had to take over fifty years to get the trains running on the rails again (in 1999). 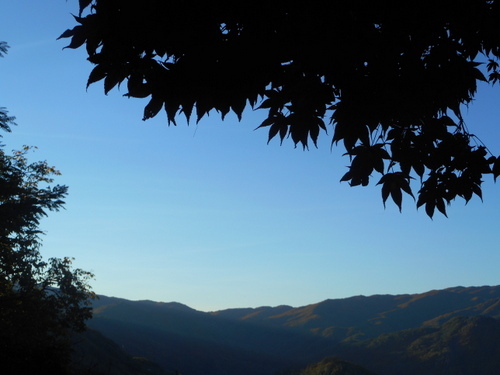 It was well worth the wait for not only does the route pass through some spectacular scenery but has also become a well-used commuter route to and from the Mugello region of Tuscany. 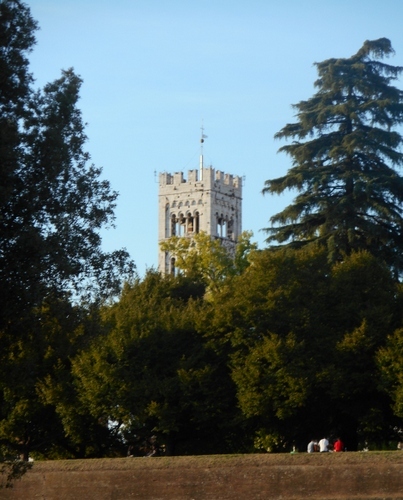 The full route takes one to Ravenna with its awesome Byzantine basilicas, mosaics and, of course, Dante’s tomb. One can, however, stop at some beautiful places en route. Faenza, we visited some years ago when we had to go by train round Pontassieve. 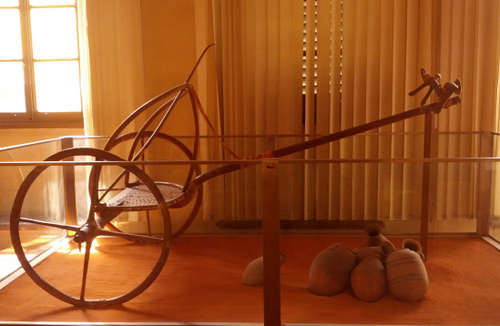 If you’re into pottery and renaissance crockery (Faenza is where we get the word Faience from) go there for the museum is fabulous, the eateries are great (especially the flat unleavened bread called Piadina) and the town is absolutely charming. We only had an afternoon to travel from Florence yesterday but visited two places which we found very rewarding. Florence Railway station is one of Italy’s seminal modern buildings. Desiged by a team headed by the great Michelucci to replace the old station (designed by Isambard Kingdom Brunel of Clifton Bridge fame) and completed in 1934 its amazing glass roof is an evocation of the city’s Arno river. This time it’s platform 16 where a poignant memorial has recently been erected to remember the thousands of victims of man’s intolerance to man who were deported to the Nazi death camps between 1943 and 1945. It’s only respectful to give a minute’s silence to this exterminating railtrack. 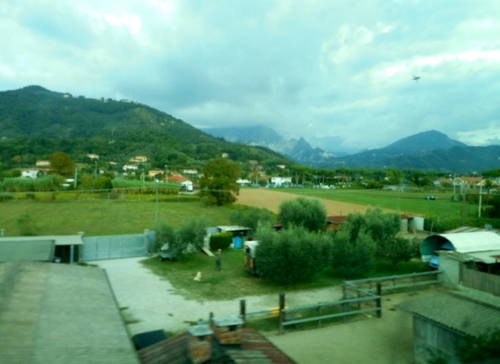 we alighted at Marradi, famous for the biggest and best chestnut festival in the whole of Tuscany. The town is homeland of the great Italian poet Dino Campana (who was born there in 1885 but who sadly ended his days in a lunatic asylum and is buried in the Badia of Scandicci near Florence in 1932). We also visit the chestnut museum. I was amazed to find also a section on the chestnut industry in Australia. I’d never thought there was one. 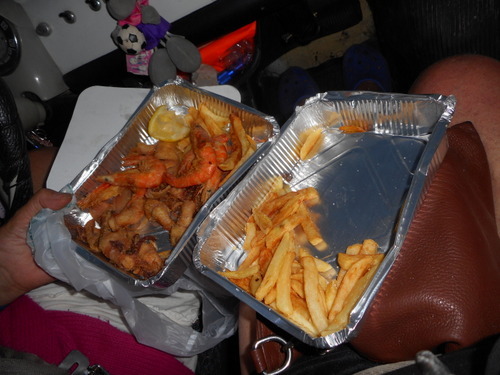 Our second stop, was a wonderful surprise…but you must read tomorrow’s instalment to find out what surprise! PS Warning. The magic railway line starts at platform 17 at Florence’s main-line SantaMaria Novella station. What the authorities don’t tell you is that it’s a long way down from the starting platfrom of all the other railway lines and requires a ten minute’s walk to get there! With the amount of rain that has fallen over the past week lovely waterfalls are appearing everywhere. Thank goodness the local administration had the foresight to place weirs and broaden the valleys of some local torrents last summer. We thought they’d overdone things but not a bit of it! Here’s the scene near us where we come to fill our bottles with thankfully unchlorinated fresh mountain torrent water. There is something so magical about the rushing of waters. 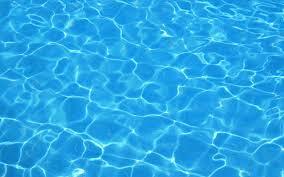 Truly water is life itself! The way forwards on in Italy is to carry out more of these hydro-geological scheme else the country could literally crumble and wash away. One has to realise that living in Italy means living in a geologically much younger country – no Cambrian rocks here as in the UK. Mountains, for example, are formed by tectonic plates folding the rocks and not created by upraised ancient plateaux being dissected by watercourses. Great! For today we’re off in our secret costumes to take part in the biggest Games and Comix festival in Europe (I believe there’s a bigger one in Japan). It’s at Lucca and for further information see http://www.luccacomicsandgames.com/en/2015/home/ ). We were last here in 2013 (see my post at https://longoio.wordpress.com/2013/09/19/the-tiger-of-malaysia/ ) and it’s always brilliant fun, that is if you don’t mind the huge crowds!). This year Sandra’s keeping hers yet again a secret. Will let you know photographically when the secret’s out! 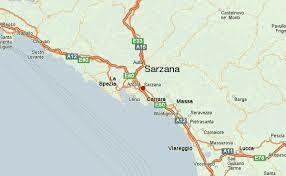 Sarzana is sited in a very strategic position between three regions of Italy: Tuscany, Liguria and Emilia-Romagna. Just look at the map. 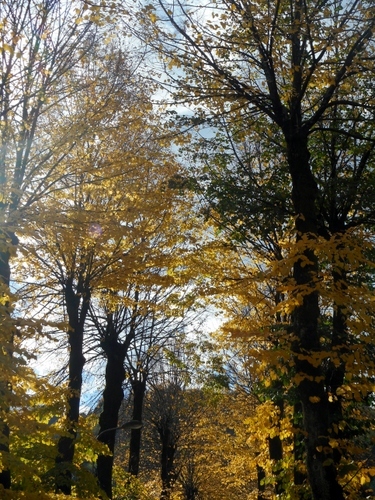 The town controls the route across to Parma; it’s a gateway to the Ligurian Sea and is also at the entrance of a pass leading to the Lombardy plain. It’s not surprising then that Sarzana has been fought over by several powers in its one thousand year history. It was, therefore, with the greatest interest that I decided yesterday to take a train there and visit the town and its fortifications. Sarzana is an absolute delight. Whether you’re into Medicean fortifications, speciality shopping, gourmet restaurants, or architecture from Romanesque through baroque to art nouveau Sarzana has all these and more to show. Sarzana is first mentioned in 983 but the growth of the town stems from 1202 when the administration moved from Luni (the fabulous abandoned Roman town – have you visited this wonder – a Tuscan Pompeii, almost?) to a new site near the river Magra. At first part of the Pisan republic, Sarzana was conquered by the Florentines before being annexed by Genoa in 1572. All these political machinations have resulted in the building of two of the finest fortresses in the area. Note that it’s a fortress, not a castle. What’s the difference? A fortress tends to develop from the sixteenth century onwards, thus rather later than a genuine castle. A fortress is aware of the rise of fire power and, thus, has lower, more slanted, walls. 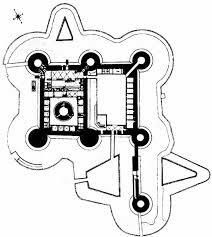 It also has Vauban-style bulwarks, big storage areas for gunpowder, platforms for cannons and complex defence systems for the principal entrance. Our Lucca is, in a sense, a fully-fledged fortress town while Pisa’s walls still reflect the pre-firepower era with its high walls which were built to withstand nothing more menacing than siege ladders and arrows. 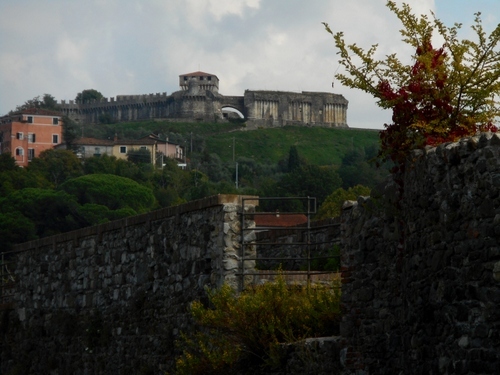 Sarzana has, in fact, two fortresses: one in town called ‘Firmafede’ (firm faith) and one on a nearby hill with an extraordinary triangular shape called ‘Sarzanello’. I had only time to visit the town fortress thus giving me a good reason for returning to this delightful town! Complex entrance defences including two barbicans. Underground passages beneath the towers. (Please note, if you want to see rusty suits of armour or cannons etc. you’ll be disappointed. Firmafede fortress hasn’t got much else to offer except its marvellous architecure and stupendous views). The fortress was given in 1814 to the kingdom of Sardinia which later that century was the propulsive force behind Italian unification. Interestingly, for Bonaparte devotees, a branch of the Cardolingi di Borgo Nuovo family acquired the name of Bonaparte and settled in Sarzana in the thirteenth century. In 1512 one of their members moved across to Ajaccio Corsica and…the rest is history. Napoleon also made it the capital of one of his Italian cantons. Sarzana continued its defensive importance during WWII when it was the centre of strong anti-fascist partisan activity. Fortunately, it wasn’t devastated like some other towns (e.g. Aulla) and so luckily we have an almost perfectly preserved fortress town for everyone to enjoy and appreciate. There’s a lot more to Sarzana than its two fortresses of course. But you’ll have to wait for my next posts to discover what they are!